Details relating to the Slovakian Commemorative of 2009. The central motive shows a stiyalised bell which is made out of many keys. Under the bell, in a small square the initials of the artist – PK can be seen as well as the Mint Sign (MK) in a small circle. On the top half of the inner circle is the inscription 17.NOVEMBER SLOBODA DEMOKRACIA (17.NOVEMBER FEEDOM DEMOCRACY). 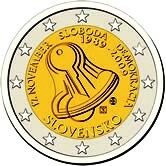 From Slovakian Commemorative 2009 to euro coin collector.